New products for fifth edition Dungeons & Dragons have rolled out relatively slowly. Compared to previous editions of the World’s Greatest Roleplaying Game, it’s been at a flail snail’s pace. (Speed 10 ft. for a large creature? That’s pretty slow.) The pace certainly picked up now in 2018, starting at the Stream of Many Eyes when Wizards of the Coast announced two new story adventures set for release later in the year, followed by Nathan Stewart’s cryptic tease of new campaign settings. And then we got two of those! Of course, there’s always new third party content rolling out, but we’ll get our hands and bookshelves full from all the new stuff on the way from WotC itself. A handy post over on the D&D subreddit compiled the list, so let’s check it out. 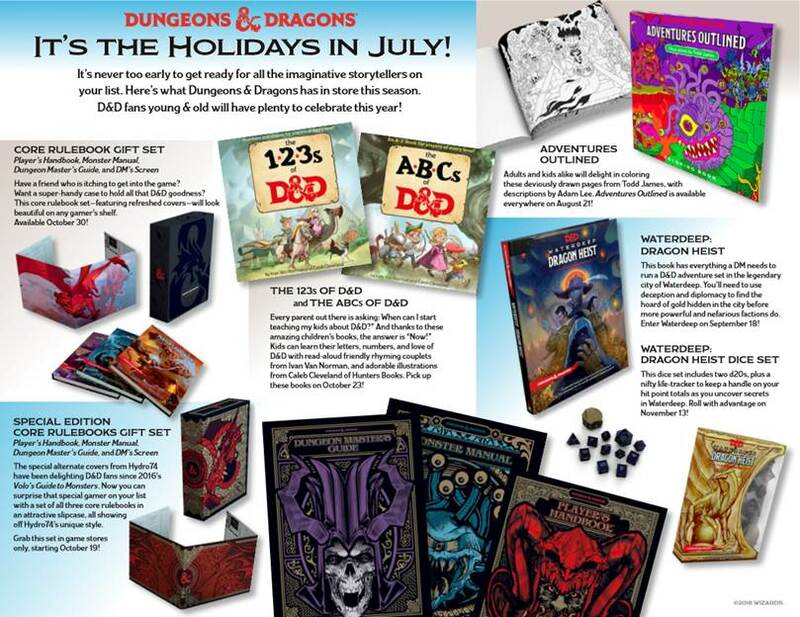 This isn’t even everything on the 2018 release calendar for D&D! “Wayfinder’s Guide to Eberron brings the eponymous campaign setting to the fifth edition of Dungeons & Dragons. This 175 page book gives you everything you need to create an Eberron story or character, exploring the core themes of the setting and the rules to implement them in fifth edition. It includes an overview of Khorvaire and the fantastic city of Sharn, along with a host of background ideas and story hooks. This PDF sourcebook for Eberron is presented as a living document, so it will be updated in the future. Perhaps it will be the perfect place for the artificer class to officially become part of fifth edition D&D. This book rubbed some people the wrong way, since it is considered playtest material but carries a pricetag unlike the Unearthed Arcana content WotC shares for free. We’re certainly not casting judgement on anyone for their perspectives, but Nerdarchy was happy to see this book’s release. 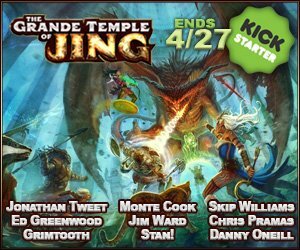 The list of credits includes the campaign setting’s original creator, Keith Baker, along with folks we trust to create great stuff like Mike Mearls and Jeremy Crawford. It is cool to see Kate Welch’s name in the credits too. We were excited to hear when Kate earned her position on the D&D design team and look forward to seeing more of her work in future products too. And our friend Ruty Rutenberg, who is extremely well-versed in Eberron knowledge and runs tons of D&D games in the setting with Maze Arcana, is also part of the design team for Wayfinder’s Guide to Eberron. Personally, I’m happy to know it’s a living document because I’ll be eagerly awaiting the addition of content about my favorite aspects of Eberron: Xen’Drik and the city of Stormreach, and more about the quori and the Dreaming Dark. Gimme some dream creatures, unexplored jungles and an awesome city run by the Coin Lords! You can get a PDF copy of the book at the Dungeon Master’s Guild, as well as finding it on D&D Beyond. Not exactly my jam, but if you’re into coloring books or have kids in your life, or just can’t get enough D&D content, you might dig it. It’s released in hobby stores already, and releases on Amazon and elsewhere August 21. Adventures Outlined is worth taking a look at. People find a lot of relaxation painting miniatures, maybe coloring will become your new way to chill. I was a HUGE fan of the Endless Quest series back in the day. Pillars of Pentagarn, Revenge of the Rainbow Dragons, Light on Quest’s Mountain — all those were terrific. Incidentally, my Dungeon Master on the live stream Secrets of Castle Greyhawk digs them too. DM Sean McGovern created an adventure for us based on the Mountain of Mirrors book recently! This new Endless Quest series features one book for each of the core classes in fifth edition D&D. Escape from the Underdark, described above, if for fighters. To Catch a Thief is for rogues, Into the Jungle for clerics and wizards find themselves in Big Trouble. All the books are written by Matt Forbeck and release on September 4. You can find them all over here on Amazon, and bonus — the OG series is there too. I might have to get all nostalgic and pick those up. Usually, revisiting stuff I liked in my youth is disappointing, but maybe I’ll glean a little metagame insight for our further dungeon delves over on The Greyhawk Channel. A new D&D adventure! This one takes characters from 1st to 5th level on an urban adventure set in Waterdeep, the City of Splendors in the Forgotten Realms. But it’s not only an adventure, it’s also a sourcebook for creating and running urban adventures of your own. That’s one of the niftier aspects of fifth edition D&D adventures from WotC that they’ve been very explicit about particularly with the announcement of this one. Each of the official adventures is meant to be a guide of sorts to different sorts of quests and campaigns. For example, Out of the Abyss is a great resource to aid in crafting subterranean adventures, Curse of Strahd for horror-themed stories, Tomb of Annihilation for hex crawls and so forth. Urban adventures are getting a lot of love in 2018, through this plus the Eberron stuff that includes Sharn, and another new campaign setting book coming later in the year too. Preorders for Waterdeep: Dragon Heist have been live on Amazon already, and you can be sure I locked in mine. I’ll unlock it on D&D Beyond through my Legendary Bundle too, where it’ll release on September 7 along with hobby stores, and September 18 on Amazon and elsewhere. I’m an unabashed DDB fanatic so I can’t wait to pour over it there but I still like to have the physical books too. Particularly for adventures, I prefer to use the physical books if I’m running an adventure. The fifth edition Dungeons & Dragons Player’s Handbook, Dungeon Master’s Guide, Monster Manual and Dungeon Master’s Screen get the royal treatment with these hobby store exclusives. Alternate art from Hydro74, who did the special edition covers for Volo’s Guide to Monsters and Xanathar’s Guide to Everything, depicts the iconic creatures on the regular edition books in his own artistic style. 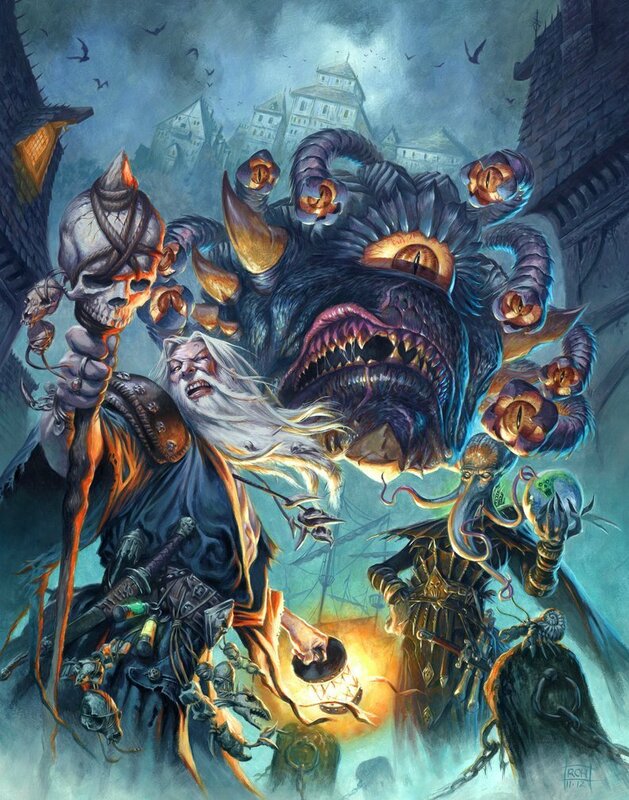 King Snurre, Acererak and the Xanathar are beautifully depicted on these covers that release October 19. I’m content with my existing copies, but completionists, collectors or folks who don’t have copies already will love these. And the whole set comes in a collectible box, also designed with art by Hydro74. That product description sums it up pretty well, I’d say. You can preorder the regular or special edition with extras from Amazon, and it releases on October 23 as a physical and ebook. Something like this would make a wonderful gift for a D&D fan. 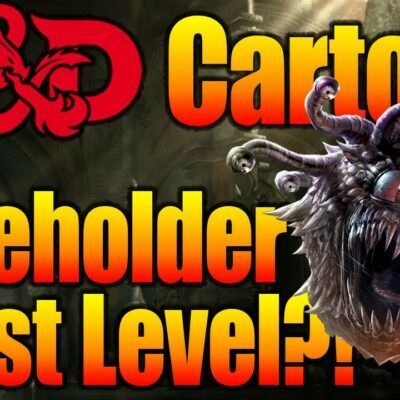 Side note: the award-winning documentary Eye of the Beholder: The Art of Dungeons & Dragons premiered at Gen Con 2018, and Nerdarchist Dave and I were among the first people to view this remarkable film. If you like D&D at all, you will enjoy this movie. Brought together by our friends Brian Stillman, Kelley Slagle and Seth Polansky with a ton of hard work from them and a successful Kickstarter, the movie will be released to backers later this year. We’ll absolutely let y’all know where and when you can see this film for yourself, which you definitely should. 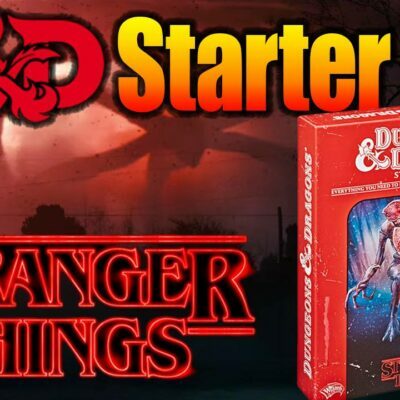 You’ll laugh, you’ll cry, and you’ll fall in love with D&D all over again as you gain a deeper appreciation for the incredible art that has helped bring D&D to life for over 40 years and the amazing artists who created it. “A child can get their first glimpse into the world of Dungeons & Dragons, even as they learn the alphabet, a precursor to every new path in reading. D&D is marketed for ages 12 and up, but you can set kids on the path towards a lifetime of adventure earlier while helping their education with these two books by Ivan van Norman of Geek and Sundry fame as well as all the cool stuff from Hunters Books. The big question: is “D” for dungeon, or dragon? And will modrons help teach about numbers?! You can preorder both of these on Amazon, either the ABCs of D&D or the 123s of D&D, or both. Like the alternate cover set above, but with the cover art we all know and love from the fifth edition D&D Player’s Handbook, Dungeon Master’s Guide, Monster Manual and Dungeon Master’s Screen — but in the same collectible box. So if you have a set that needs replacing, don’t have a set, or want to give an awesome gift to a new player who doesn’t have a collection yet, this would be perfect. Maybe that player at your table will be inspired to take a turn in the DM’s chair too. You can preorder this for release on October 30. Remember how I said each D&D adventure is also a guide to different sorts of campaigns? This one drops the megadungeon of megadungeons on the party! 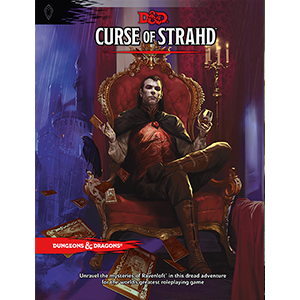 Designed for characters level 6-20 that picks up after Waterdeep: Dragon Heist, the party delves into one of the most iconic dungeons in D&D history – Undermountain! “In the city of Waterdeep rests a tavern called the Yawning Portal, named after the gaping pit in its common room. At the bottom of this crumbling shaft is a labyrinthine dungeon shunned by all but the most daring adventurers. Known as Undermountain, this dungeon is the domain of the mad wizard Halaster Blackcloak. Long has the Mad Mage dwelt in these forlorn depths, seeding his lair with monsters, traps, and mysteries—to what end is a constant source of speculation and concern. Skullport is full of scoundrels, and I can’t wait to explore the iconic hive of scum and villainy beneath Waterdeep. I’m super excited about this one for several reasons. For starters, one of my favorite designers, Dan Dillon, was part of the design team. I’ve used a lot of stuff Dan created in my home games and loved it, so it’s awesome to see what he’ll bring to the table in an official WotC product like this. James Haeck also contributed, as well as James Introcaso, Matt Mercer, Lysa Chen, and Matt Click. Second, I’ve been itching to run a megadungeon campaign for some time. Maze of the Blue Medusa is near the top of the list, and the recent second printing from Satyr Press means I’ll have a physical copy of that soon — I’m already hyping it up to my home group. Lastly, this book includes Skullport, which means there’s going to be more of the Xanathar Guild inside. And that’s a great thing. You can of course preorder Waterdeep: Dungeon of the Mad Mage on Amazon like I did, and get a copy when it releases on November 13. It comes out earlier, on November 2 at hobby stores and DDB, so I’ll certainly be checking it out there first but like I said, I prefer the physical book for running adventures and I cherish the collection of D&D books on my shelf too. There’s also a Dungeon of the Mad Mage Map Pack to help chart your course through this iconic megadungeon. In you’re going to pull a heist in the City of Splendors, you’re gonna need some dice. The Dragon Heist Dice Set comes with an extra d20 for advantage and d6s for sneak attacks and those sweet fireballs, plus a life counter. If I’m honest, this dice set doesn’t interest me all that much. I’m a fan of more colorful dice, and the life counter doesn’t feel like much of a value add especially since it only has two digit counters. If you make it all the way through Undermountain and reach 20th level, more than a few characters will reach triple digit hit points. Sorry, barbarians. Nevertheless, it’s of course available for preorder on Amazon for a November 13 release. “Explore a worldwide cityscape filled to the brim with adventure and intrigue in this campaign setting for the world’s greatest roleplaying game. 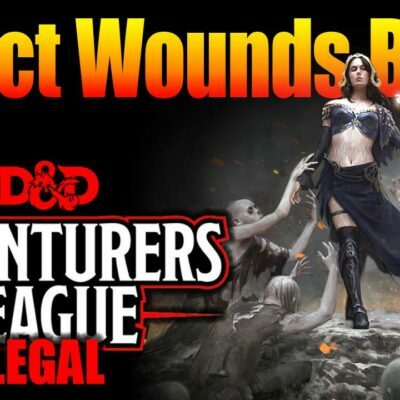 Prior to the announcement of this new campaign setting for fifth edition Dungeons & Dragons, I had my own suspicions about what WotC would release. I was convinced it would be either Dark Sun or Spelljammer. 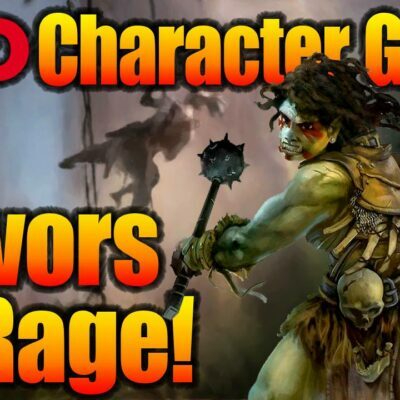 The former because it is one of the most beloved campaign settings in D&D history, one that people clamor for on the reg, and is different enough to make for new sorts of adventures based around survival in a harsh environment. As for the latter, it was a dark horse speculation but there’s a lot of folks who dug the gonzo fantasy space setting, including me — I ran a live stream D&D 5E Spelljammer game on the Nerdarchy channel and a home campaign for over a year too! But instead we’re getting the Guildmasters’ Guide to Ravnica, which was a surprise that got inadvertently revealed a day early thanks to the Amazon product page. And I’m totally cool with this. It would have been neat to see a classic D&D setting brought to fifth edition, sure, but if I’m honest, I’m more excited about Ravnica and here’s some reasons why. First off, it’s something totally new to D&D. 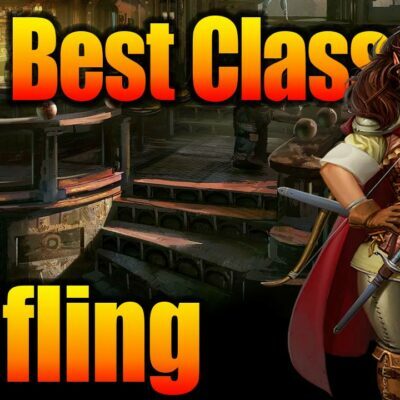 I’ve played and run games in classic settings without any official 5E release. There’s decades of material out there to draw from and, while mechanical bits like monsters, ship travel, psionics and the like so integral to various settings don’t have 5E adaptations, it’s not terribly difficult to create our own content for these or simply reskin existing stuff. My own Spelljammer campaign at home is a mashup of core 5E stuff, Hyperlanes, Esper Genesis, some Kobold Press stuff and a bunch of homebrewed creatures. Aside from mechanical material, the lore, culture, environmental and other content from the past provides more than enough to go on. Second, and this is something I hope those upset by Ravnica and disappointed not to see other settings from D&D history make their 5E debut can find comfort in, this might make those future products better. Think of it this way: Ravnica will be a great opportunity for WotC to see what works and what doesn’t through the community response to GGtR. Based on the reception and feedback, when they design additional settings for fifth edition release in the future (and they will) the process will have a foundation of data and metrics to build on. So when Dark Sun comes around, or Kara-Tur, or whatever, it will be stronger for it. Look at the history of the published adventures. They’ve gotten better with each release, generally speaking. Do you want your favorite setting to the the Tyranny of Dragons of new campaign settings, or the Tomb of Annihilation? Granted, the progression isn’t strictly linear and not everyone likes each adventure progressively more than the last, but overall they’ve mostly improved each time. Also, like Waterdeep: Dragon Heist, GGtR seems heavily aimed at urban adventures…except the city in question spans an entire plane of existence. And within that city, the titular Ravnica, it ain’t all just medieval fantasy city. Simic Combine experimentation, Golgari reclamation activities and so much more await to be explored. From what I’ve read and heard, GGtR will deepen player character experiences through interaction with the guilds and your companions affiliations as well. Frankly, I can’t wait to find out and all the cool people, places and things in the city of Ravnica. I will say, the cover art on the book seems to have a misleading effect on those not familiar with Ravnica, who interpret it as a steampunk/magicpunk setting. Announcing the same day as Wayfinders Guide to Eberron kind of muddied the message too. The GGtR cover depicts a member of the Izzet League, a guild of magical technologists, but there are nine other guilds much different than this one. Trust me — Ravnica is a dynamic setting with all sorts of opportunities for different and diverse characters and adventures. And that’s that, whew! Lots of new products in the pipe from WotC in 2018. 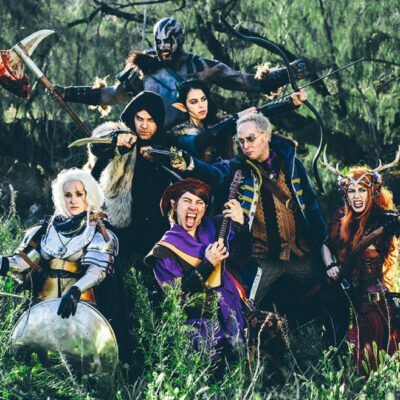 Between these, and all the video content the D&D is sharing like the phenomenal Dice, Camera, Action actual play show, Mike Mearls Happy Fun Hour, Hell’s Belles, Dark and Dicey, Trapped in the Birdcage and more, the D&D team is provided a steady stream of quality content to entertain, bring people together and help make our games better than ever. Here’s a video where Nerdarchists Dave and Ted and I discuss our thoughts about GGtR and WGtE on announcement day, but what do you think? 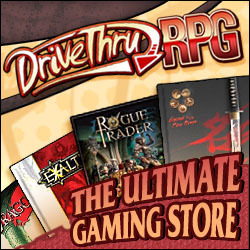 What WotC D&D products are you excited about, or not excited about at all? What’s on your wishlist of dream products? Please share your thoughts in the comments below and as always, stay nerdy!